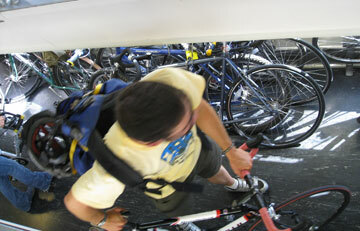 Recently I took Caltrain with bike during evening rush-hour and experienced the ongoing hassle of bike crowding. As is typical, there was one car for bikes, when two cars are called for during peak commute. It was heartening to see men and women boarding the train with every kind of bike under the sun. Not so long ago, bikes were banned. While crowding is bad enough, imagine no Caltrain at all. Caltrain has its hands tied when it comes to funding. The three main transit entities – San Francisco Municipal Transportation Agency (Muni), San Mateo County Transit (Samtrans), and Santa Clara Valley Transportation Authority (VTA) are represented on the the Peninsula Corridor Joint Powers Board (Caltrain). They all face financial problems due to repeated massive state transit funding cutbacks and take-aways. At the July 1 Joint Powers Board meeting, they will consider – you can guess – a public hearing on September 2, 2010, for consideration of service suspensions and fare changes. The way things are going, without funding from somewhere, train service could stop. Each of the member agencies has as its first priority keeping its own transit funded, so they all face a lot of pressure to cut their share of Caltrain’s operating cost. Further, historically, if one of the member agencies cuts back, then the other two are more likely to cut out of a sense of fairness and not wanting to pay more than their fare share. What’s worse, the Great Recession has hurt ridership, but costs remain the same. Caltrain has never had a stable and dedicated funding source. It has no taxing authority or ability to impose any sort of levies or fees to keep itself solvent. It has always relied on the voluntary operating fund contributions from the three member agencies, and on other state grants and subsidies for transit operators. What would help is less expensive trains, like Euro-style lightweight trains. Caltrain has received a ground-breaking conditional waiver from the Federal Railroad Administration (FRA) to use them. FRA compliant trains have prevented U.S. rail operators from acquiring and using state-of-the-art high-performance trains that are in use and for sale by European and Asian train builders. If you’re one of the cyclists who takes the train, make your voice heard. Or maybe you’re OK with the daily jam. BayRail Alliance has more information. This entry was posted on June 27, 2010 at 6:20 pm and is filed under News. You can follow any responses to this entry through the RSS 2.0 feed. You can leave a response, or trackback from your own site.